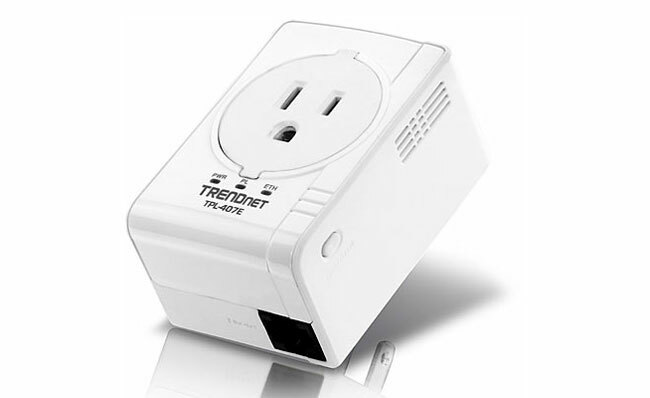 TRENDnet has announced a new 500 Mbps powerline networking adapter that has an integrated outlet. That integrated outlet is a big deal if your office or room is short on power outlets already. The adapter appears to be large enough to block both outlets. At least you can plug a surge protector a power strip into it and get more outlets in your room. The new powerline adapter is called the TPL-407E and will come in a kit with to the adapters called the TPL-407E2K. The router offers fast speeds and shoots your data across your homes electrical wires. Powerline networking is a good alternative to Wi-Fi in some instances. TRENDnet also says that the new adapter has embedded power saving technology to lower power use by 70% when in standby mode. That is a nice feature since the adapters are always plugged into the AC outlet. Individual adapters will sell for $64.99 with the kit featuring to adapters selling for $109.95. Both adapters will come this October.